This free utility benchmarks the read and write performance in megabytes per second of network attached storage connected through SMB/CIFS network shares. How it works: Temporary files of arbitrary sizes are generated and copied to and from the NAS a number of times, whereafter the average read and write speeds are calculated. *If you only have Microsoft .NET framework version 4.x installed, you can re-compile the program to that version by running the script compile.vbs included in the zip file. Note that reliable results depend on that the local computer drive, the test is being executed from, has faster read and write speeds than the NAS being tested. 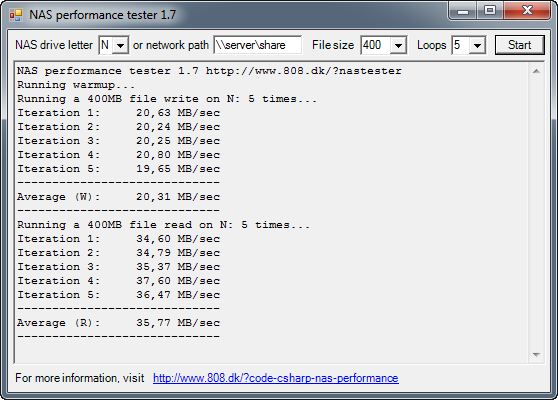 Also note that the program's method of generating the read speed test files on the NAS is specifically tuned for avoiding caching on network drives. This means that running the benchmark against local or iSCSI connected drives will give incorrect read speed results due to locally cached test files. Please use it only for testing network drives. The standard disclaimer: The program is provided 'as is' without warranty of any kind. I have done my best to incorporate graceful exception handling and to test the code in different scenarios, so it shouldn't be able to do anything bad. The source code for the program is listed below. appendIterations = 100; // equals a 10MB warmup file. Me.Text = "NAS performance tester 1.7"
driveLetterLabel.Text = "NAS drive letter"
networkPathLabel.Text = "or network path"
infoLabel.Text = "For more information, visit"
testPath = driveLetter.Text & ":"
iterText = testIterations & " times"
appendIterations = 100 ' equals a 10MB warmup file.